With a central location, state-of-the-art meeting facilities and exceptional service, Grand Park Wuxi is the ideal venue for all your meetings. Situated minutes away from the train station and a 40 minutes’ speed train ride from downtown Shanghai, the hotel is also approximately a 2.5-hour drive away from Shanghai Pudong International Airport. The Grand Ballroom, together with a total of five flexible functions rooms is well-appointed with wireless Internet access and modern technology, ensuring a seamless meeting experience. As the day’s business draws to a close, we also offer a range of services and facilities to ensure a relaxing environment for delegates to unwind or socialise with one another. Organise networking sessions or casual cocktails at our cosy bar, host private dinners in our exclusive VIP rooms at Park Palace serving Cantonese cuisine or let our culinary team create bespoke menus to suit your tastes. 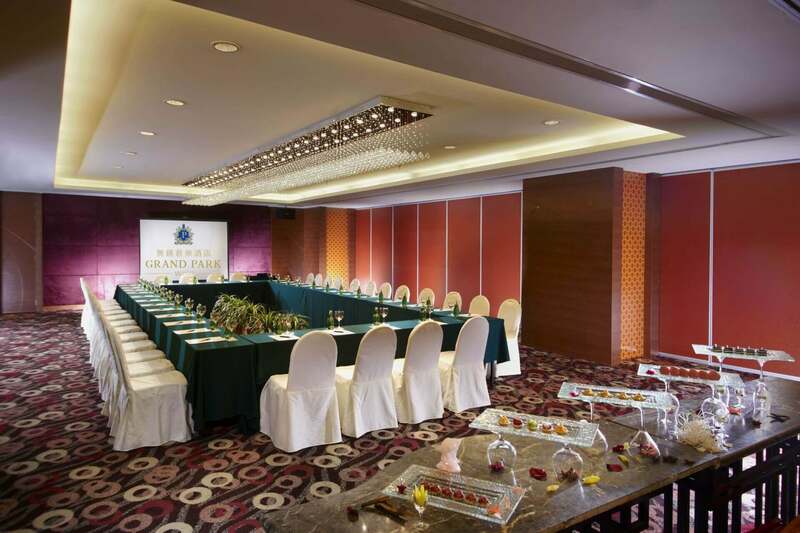 With a central location, a wide range of state-of-the-art meeting facilities, and exceptional Park service, Grand Park Wuxi is the ideal choice for your meeting venues in Wuxi. China weddings at Grand Park Wuxi set a new standard in romantic elegance. Our dedicated wedding planners will make it their top priority to ensure that your perfect day is made even more perfect when you celebrate love at this Wuxi international hotel. Be spoilt for choice with our wide selection of cuisine from Western buffets to grand full-course exquisite Cantonese cuisine or simply take pleasure in customising your own menu. Whether it is an intimate affair or elaborate banquet, we offer the most comprehensive traditional Chinese wedding services and specialise in creating events your guests will remember for a lifetime. To embark on your own Celebration of Love, please contact us at or email us. At Grand Park Wuxi, we transform your dreams into reality. Whether you are planning the perfect a special celebration, commemorating an important occasion or hosting a dazzling event resplendent revelry, Grand Park Wuxi exceeds expectations with its versatile function space, bespoke service, contemporary décor and memorable culinary experiences. Our team will provide the attentive service and anticipate your needs so that you can focus on your guests on that very special day.